With Dave Jenkins of "Pablo Cruise"
Kapono Beamer is a Grammy nominated recording artist. A talented guitarist, composer, singer, producer, arranger, engineer and recording artist, he is a multiple winner of Hawaii's version of the Grammy Awards, the "Na Hoku Hanohano Awards," with twelve awards, including Album(s) of the Year, Male Vocalist of the Year, Contemporary Hawaiian Album(s) of the Year, Instrumental Album(s) of the Year, Producer(s) of the Year, and Recording Engineer of the Year. 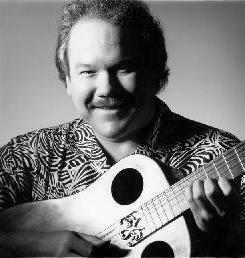 He is a great exponent of the traditional Hawaiian slack-key guitar, and to date has recorded 19 record albums. Kapono's latest release is the critically acclaimed, "Slack Key Dreams of the Ponomoe"... A collection of new original songs recently nominated for the 2006 Grammy Award for Hawaiian Album of the Year, and winner of the 2006 Na Hoku Hanohano Awards for Engineering, and the very special "Ki-Ho'Alu Award" (Hawaiian Slack Key Award). Kapono was the younger half of the popular group, "The Beamer Brothers," who defined the shape and direction of "Contemporary Hawaiian Music," and to this day have one of the biggest selling records in the history of the state of Hawai'i, the classic "Honolulu City Lights". Songs like "Mr. Sun Cho Lee", "Sweet Okole", "Only Good Times", "Seabreeze", and other works by the Beamer Brothers are forever embraced in the hearts and souls of those touched by the magic of Hawai'i. Kapono began playing music on an ukulele at the age of four years old when his mother taught him to play and dance a family song that she wrote with her grandmother, "Pupu Hinuhinu." Surrounded by uncles and aunties who sang Hawaiian songs and danced the Hula, Kapono's early influences were his family, especially his grandfather, Francis Keali'inohopono Beamer, son of beloved Hawaiian music composer, Helen Desha Beamer, and his mother, Hawaiiana authority and Hula master, Nona Beamer. Kapono's new release is called, "Slack Key Dreams of the Ponomoe". It features his smooth vocal sound in a rich tapestry of acoustic and electric guitars, with jazz drummer, Noel Okimoto, and jazz bassist, Dean Taba. There are all new songs on the CD, all composed by Kapono; and there are two Hawaiian chants, rearranged with new harmonies and even the voice of Kapono's grandmother, Louise Leiomalama Walker Beamer. "I felt the presence of my grandmother very very strongly as I was writing and recording this new project", Kapono says. "She was guiding me along... It was amazing and wonderful". "It was like I was dreaming I was back on my grandfather's Hawaiian Homes ranch in Waimea on the Big Island. It was cool and quiet with only the sounds of the famous Waimea wind, Kipu'upu'u blowing across the pastures. I felt the ticking of my grandfather's clock... I was snuggled up in my kihepili (blanket) and I could hear the sound of my grandmother's sweet voice in the kitchen. Many of the songs reflect on those happy childhood days in Kamuela, with Pueo (Hawaiian owl), and horses and cattle, and my seventeen cousins to play with." Kapono's recent CD called, "Pana Aloha, Hawaiian Heartbeat", has won the 2002 Hoku Award for "Instrumental Album of the Year". The Hawaiian heart fills the senses with love. Love for the land, love for special places, and most of all love for special people. With his new CD, "Pana Aloha, Hawaiian Heartbeat", Kapono Beamer captures the essence of the beating of loving hearts. These are songs that echo deep in the Hawaiian soul; always close at hand, pulsating in the back of the mind, and nestled in a loving heart. These songs are complete expressions of their Hawaiian composer's innermost images and feelings of aloha. Kapono says, "I was inspired to create a collection of some of the most beloved Hawaiian melodies, the kind of songs it seems I always knew. Being surrounded by Hawaiian music ever since I can remember, I guess these melodies were planted in my heart at a very young age. Some of my earliest recollections are of my mother dancing the hula to the gentle sounds of an ukulele strumming. I remember the smiling faces of my grandfather, and uncles playing their guitars and singing, and the beauty of my grandmother and aunties as they danced the graceful hula. These songs have lived inside of me since those "small kid" days and I welcome the opportunity to present them, along with one added original song, in a simple setting of new musical arrangements featuring acoustic guitars. Kapono's recent projects have found him in the recording studio with Keali'i Reichel, where he worked as co-producer on Keali'i's new hit CD, "Ke'alaokamaile". Kapono also was associate producer on Keali'is previous hit CD, "Mele Lana". Kapono's previous release is called "Great Grandmother, Great Grandson", exclusively featuring the music of Helen Desha Beamer (1882-1952), Kapono's great grandmother. Kapono was inspired to create new arrangements of Helen Desha Beamer's timeless melodies in a lovingly crafted recording production of rich acoustic guitars. This CD was awarded the 1999 Hoku Award for "Instrumental of the Year". Kapono's projects have been released internationally in Europe and the Far East. His recording sessions in Munich Germany, Budapest Hungary, and Honolulu; have resulted in Kapono's fifth in a series of international instrumental record album projects, "Sunny Holiday." Recorded with the Budapest Symphony Orchestra, for Intersound Records in Europe, "Sunny Holiday" was released in 28 countries throughout the world. Kapono recently released a new CD of contemporary island music called "Cruisin' On Hawaiian Time", with Dave Jenkins, lead singer and guitarist with the legendary, "Pablo Cruise." Inspired by the beauty and spirit of Hawai'i and her people, Kapono remains open to new influences that spark the creative fires, producing new artists, and focusing on the composition and performance of new music featuring his unique acoustic guitar style. "Slack Key Dreams of the Ponomoe", Kapono Beamer, Kapono Beamer Enterprises, Ltd., KBECD138, Hawaii, Fall 2005, All new original songs with vocals and guitars, bass, and drums. 2006 Grammy Award Nominee; Hawaiian Album of the Year. 2006 Ki-Ho 'Alu Award (Slack Key Guitar Award), 2006 Hoku Award for Best Engineering (Hawaiian Grammy). "Lifescapes: Hawaii," Music inspired by ideal vacation getaways, Compass Productions, Triad Inc., Produced, Arranged and Performed Traditional Hawaiian Instrumentals, Exclusively released in Target Stores nationally, 1997. "Sunny Holiday," Kapono Beamer, Intersound Records; ISCD 166, Germany, Released in the winter of 1996 in 28 countries in Europe and the Far East. Acoustic Guitar Instrumentals with the Budapest Symphony Orchestra. "Cruisin' On Hawaiian Time", Kapono Beamer & Dave Jenkins, Luster Bros. Records, #25247, Hawaii, Winter 1994. "Silent Crossing", Kapono Beamer, Intersound Records; ISST 183, West Germany, Released in 17 countries in Europe, winter 1987; Also released in Hawaii, Fall 1988, OnoPak Music; KAP 129. Acoustic guitar instrumentals. "Daydreams", Kapono Beamer, Intersound Records; ISST 159, West Germany, released in 17 countries in Europe, winter 1985; Also released in Japan and Hong Kong on CBS/SONY Records; 28AP 3187, summer 1986. Acoustic guitar instrumentals. "Pure Hawaiian Magic", Keola and Kapono Beamer,Paradise Productions,PCD 2010, Hawaii, 1991. Compilation "Best Of"/Contemporary Hawaiian. "Tahiti Holiday", Keola and Kapono Beamer, Lee Records/Paradise Productions; SLP 689, Hawaii, 1982. Contemporary Hawaiian. "Island Night," Keola and Kapono Beamer, Paradise Productions; SLP 816, Hawaii, 1980. Contemporary Hawaiian. "The Best of Keola and Kapono Beamer", Music of Polynesia; MOP 49000, Hawaii, 1978. Compilation"Best Of" Contemporary Hawaiian. "Hawaii's Keola and Kapono Beamer", Tantalus Records; KK 1001, Hawaii, 1975. Contemporary Hawaiian. "Hawaii Then and Now", Keola and Kapono Beamer, Music of Polynesia; MOP 35000, Hawaii, 1974. Contemporary Hawaiian. "This Is Our Island Home, We Are Her Sons", Keola and Kapono Beamer, Music of Polynesia; MOP 29000, Hawaii, 1972. Contemporary Hawaiian. "Metro," Starring Eddie Murphy, Directed by Thomas Carter, Touchstone Pictures, Arranged and Produced music used for underscoring in the closing location Tahiti scenes, 1997. "And Then There Were None," Written and Directed by Elizabeth Lindsey, Documentary about the vanishing Hawaiian Race. Composed and performed musical score, 1995. "Hawaii: Born In Paradise" ("Hidden Hawaii"), Directed by Robert Hillmann, an IMAX feature film focusing on the fragile environment of Hawaii. Performance of Hawaiian Nose flute and Hawaiian musical and percussion implements with musical score by Mark Isham, Hawaii IMAX Theater, Waikiki, Honolulu, Hawaii 1991. "Moloka'i Solo," Produced and Directed by Bob Liljestrand, Honolulu, Hawaii, Composed and performed musical score, 1987. "Big Wednesday," Directed by John Milius, Warner Brothers Motion Pictures, Hollywood, California, Co-Authored lyrics and performed vocal for Theme Song,"Only Good Times," also performed additional Slack Key guitar, Hawaiian Nose flute, Hawaiian percussion implements, 1978. "Who Wants To Be A Millionare," Syndicated National Television, Use of original music for underscoring, 2001. "Oprah Winfrey Show," Syndicated National Television, Use of original music for underscoring, 2001. "America's Funniest Home Videos," Syndicated National Television, Use of original music for underscoring, 2000, 2001. "Baywatch Hawaii," Syndicated International Television, Use of original music for underscoring, 2000, 2001. "Family Matters" TBS Television Network, Use of original music for underscoring, 1998,1999,2000,2001. "Full House" TBS Television Network, Use of original music for underscoring, 1998,1999, 2000, 2001. "Murphy Brown" Lifetime Television Network, Use of original music for underscoring, 1998,1999,2000, 2001. "Drew Carey Show", ABC Television Network,Use of original music for underscoring, 1998,1999, 2000, 2001. "Baywatch," Syndicated International Television, Use of Original Music for theme, Hawaii Episode, 1995, 1996, 1997, 1998, 1999. "Great Chefs of Hawaii," Discovery Channel, Composed and Performed theme for 30 shows filmed in Hawaii, 1996, 1997. "Full House," ABC Television Network, Use of original music for underscoring, 1995,96. "Ren and Stimpy," Nickelodeon Television Network,Use of original music for underscoring, 1994, 95, 2000, 2001. "Days Of Our Lives," NBC Television Network, Use of original music for underscoring, 1995. "Senior Skins Golf Tournament," ABC Television Network, Use of original music for underscoring, 1994. "America's Most Wanted," Fox Television Network, Use of original music for underscoring, 1993. "Family Matters," ABC Television Network, Use of original music for underscoring, 1992, 1993. "Senior Tour Golf Championship," ABC Television Network, Use of original music for underscoring, December 1992. "Kapalua International Golf Tournament," ABC Television Network, Use of original music for underscoring, November 1992. "Dream On," HBO Television Network, Use of original music for underscoring, 1992,93,94,95. "European Journal," PBS Television Network, Use of original music for underscoring, May 1992. "International Swimming Championships," NBC Television Network, Use of original music for underscoring, May 1991. "One Life To Live," ABC Television Network, Use of original music for underscoring, April 1991. "Kaua'i, The Magic Of Na Pali," The Travel Channel, Composed and performed original score. 1988. "Moloka'i Child of the Sea," The Travel Channel, Composed and performed original score. 1988. "Down The Stretch," ESPN., use of original music for underscoring, April 1986. "Heartbeat of The Pacific," S.P.N. (Satellite Program Network), appeared in and performed original music, Jan./Feb.1985. "MTV," (Music Television),"Escape to Paradise," New York, New York, first music video from Hawaii to appear on MTV, 1984. "NBC Sports World," "World Cup Surfing Championship," NBC, use of original music for underscoring, July 1984. "Kapalua International Golf Tournament," ESPN, use of original music for underscoring, November 1984. "Hawaiian Open Golf Tournament," NBC, use of original music for underscoring, February 1980. "Sesame Street," Children's Television Workshop, Public Broadcasting Network, New York, New York, appeared in and performed original music, 1977. "Channel 2 Evening News", KHON TV 2, Fox Television affiliate, Composed and performed music for opening theme and themes for weather and surf reports, 1999-2004. "Songs On The Wind," KHET, Green Glass Productions, Docudrama examining the spiritual and political changes in Hawaii, viewed thru the eyes of Hawaiian Royalists , Composed and performed musical score, 1995. "Hot Hawaiian Nights," Kapono Beamer & Dave Jenkins, KHNL TV13, Live concert performance, 1995. "Huliau," KGMB TV-9, Green Glass Productions, Docudrama examining the spiritual and political changes in Hawaii, viewed thru the eyes of Hawaiian Ali'i , Composed and performed musical score, 1994. "A Cry Of Peacocks," KITV-4, Green Glass Productions, Docudrama chronicling the life of the Hawaiian Princess, Ka'iulani, Composed and performed musical score, 1993. "Secret Blossoms," KITV-4, Series of vignettes describing beliefs that underlie Hawaiian culture, Composed and performed musical theme, 1992. "BANKOH Moloka'i Hoe '92," KHON TV-2 Special, extensive use of original music, 1992. "Moloka'i Hoe Na Wahine O Ke Kai," KHON TV-2 Special, extensive use of original music, 1992. "Hawaii's Superkids," KGMB TV Special, extensive use of original music, 1992. "Mixed Plate,"KITV 4 Special, Pamela Young's Profile of Women of the Big Island, extensive use of original music, 1990. "New York Island Style," KHON TV 2 Special, extensive use of original music, November 25, 1988. "1987 Merrie Monarch Festival," KITV 4 Special, extensive use of original music, April 24 and 25, 1987. "Ellison Onizuka Tribute," KITV Channel 4 Newscast, Honolulu, Hawaii, extensive use of original composition, January 30 1987. "Moloka'i Ho'e 1986," KITV Channel 4 Special, Honolulu Hawaii; extensive use of original music, telecast October 1986. "1986 Merrie Monarch Festival," KITV Channel 4, Honolulu, Hawaii; extensive use of original composition, April 4, 5, 1986. "Moloka'i 's Forgotten Frontier," KGMB TV, NEWSROOM 9 Special, Honolulu, Hawaii, use of original music, November 1985. "Moloka'i Ho'e 1985," KITV Channel 4 Special, Honolulu, Hawaii, use of original music 1985. "The NFL Hawaiians," KHON TV 2 Television special, Honolulu, Hawaii, use of original music 1985. "Merrie Monarch Festival," KITV Channel 4, Honolulu, Hawaii, extensive use of original music, 1985. "Hawaiian Moving Company," KGMB TV Channel 9, Honolulu, Hawaii, Composed and performed theme song, "Pipeline Slack Key," September 1984 through Feb. 1996. "Curtain of Fire," Larry Price television special, KITV Channel 4, Honolulu, Hawaii, Composed and performed music, 1984. "Spectrum Hawaii," Mary Kawena Pukui Tribute, KHET Hawaii PBS, extensive use of original music, 1984. "Island Life," Emme Tomimbang special, KITV Channel 4, Honolulu, Hawaii, Composed and performed theme song, 1983. "Moloka'i Ho'e Aloha," Larry Price television special, KITV Channel 4, Honolulu, Hawaii, performed original music, 1983. "TV 2 Evening News," KHON TV 2, Honolulu, Hawaii, Composed and performed theme music played at the end of every telecast, 1980 - present. "The Beamer Brothers in Tahiti"/"Tahiti Holiday," KGMB television special, Honolulu, Hawaii, starred in and performed original music, 1982. "The Beamer Brothers Live from the Monarch Room," Royal Hawaiian Hotel, KHON TV 2 television Special, Honolulu, Hawaii, starred in and performed original music, 1978. "Slack Key Dreams of the Ponomoe"
5 for "Escape To Paradise"
6 for "Honolulu City Lights"
"Oahu, The Gathering Place," Pacific Focus Productions, Composed and performed musical score 1999. "Huliau," KGMB TV-9/ Green Glass Productions, Docudrama examining the spiritual and political changes in Hawaii, viewed thru the eyes of Hawaiian Ali'i , Composed and performed musical score, 1994. "Hawai'i Visitors Bureau, Asia/Japan Sales Video," Pacific Focus, Inc., Composed and Performed musical score, 1992. "Reyn Spooner Hawaiian Tradition," Hawaii Production Center, Use of original music for underscoring, 1992. "On The Wings of A Butterfly, The Big Island of Hawaii," Pacific Focus and Papillon Helicopters Production, Composed and performed original score, 1990. "Waimea Falls Park," Alphamedia and Waimea Falls Park Production, Composed and performed original score, 1988. "On The Wings of A Butterfly, Maui Adventure," Pacific Focus and Papillon Helicopters Production, Composed and performed original score, 1988. "Kaua'i, The Magic of Na Pali," HHF Productions, Composed and performed original score, 1987. "Moloka'i, Child of the Sea," HHF Productions, production for The Discovery Channel, Composed and performed musical score,1986. "Inflight Fashion Show," Videocassette production for Continental Airlines/Air Micronesia, Composed and performed original music, 1984. "Stouffer's Wailea Beach Hotel," in house promotional video, extensive use of original music, Wailea, Maui, 1983 to present. "Inside Hawaii," Visions International Videocassette, Honolulu, Hawaii, Composed and performed musical score, 1982. "Ke'alaokamaile," Keali'i Reichel, Punahele Productions, 2003. "Mele Lana," Keali'i Reichel, Punahele Productions, 1999. "Pride Of Punahele," Keali'i Reichel, Punahele Productions, 1998. "Lei Hali'a," Keali'i Reichel, Punahele Productions, 1996. "Ka Manawa Pono," Uluwehi Guerrero, Punahele Productions, 1995. "I Shall Sing," Loyal Garner, Pi'ilani Enterprises, Honolulu, Hawaii, 1992. "E Mau Ana Ka Ha'aheo (Enduring Pride)," Olomana, Better Days Records, Honolulu, Hawaii, 1991. "Great Fires of Our Time," Melinda Carrol, Legend Productions, Honolulu, Hawaii, 1990. "Expecting Friends," Jerry Santos, Better Days Records, Honolulu, Hawaii, 1989. "Pacific Coast Jam... Guitar Workshop in Hawaii," Victor Music Industries, Invitation, VDR 1624, Japan, 1989. "Never Far From Home," Randy and Gay Hongo, Keola Hou Productions, Honolulu, Hawaii, 1988. "Road To Paradise," Melinda Carrol, Legend Productions, Honolulu, Hawaii, 1988. "Wisdom Of A Child," Nohelani Cypriano, Kokonutt Records; Honolulu, Hawaii, 1987. "More Than Just A Song,"Loyal Garner, Pi'ilani Records; Honolulu, Hawaii, 1987. "Noly," Noly Paa, Pali Winds Records, Honolulu, Hawaii, 1985. "Share The Light," Momi Riley, Amber Rose Productions, Honolulu, Hawaii, 1985. "Friends Who Rode The Waves," Various Artists, Shell Records, Honolulu, Hawaii, 1983. "Pacific Paradise," Various Artists, Nickong Enterprises and CBS/Sony Records, Tokyo, Japan, 1983. "Pacific Bad Boy," Brother Noland, Mountain Apple Co., Honolulu, Hawaii, 1983. "Islands," Malani Bilyeu, Paradise Productions, Honolulu, Hawaii, 1983, (also produced two songs, "Islands," and "Only Good Times). "Towed Away," Rap Reiplinger, Paradise Productions, Honolulu, Hawaii, 1983, (also Composed and performed additional music and lyrics). "In The Evening," Nohelani Cypriano, Kokonutt Records, Honolulu, Hawaii, 1982. "Nohelani," Nohelani Cypriano, Hanaola Records, Honolulu, Hawaii, 1980. "The Honolulu Boys Choir," Honolulu Boy's Choir Christmas Album, Honolulu, Hawaii, 1978. "The Music of Hawaii," Various Artists, National Geographic Society, Washington, D.C., 1974. Hawaiian Plantations, Inc. Composition/Performance Hawaiian Slack Key Guitar, 1992. PRI, Loomis & Pollock, Inc., Performance of Hawaiian Nose Flute,1990. Pure Hawaiian Water, Klein and LaBrucherie Advertising, Los Angeles, Composed and performed music, 1988-1991. First Hawaiian Bank, Composed and performed music, 1983, 1984. Hinano Beer, appeared in and Composed and performed music, 1982, 1983. Hawaiian Plantations, Composed and performed music, 1982, 1983. South Pacific Island Airways, endorsement and performed original music, 1982. United Airlines, appeared in and performed music, 1981. Big Brothers of Hawaii, Composed and performed music, 1979-1984. Hawaii Dental Service, appeared in and performed music, 1978-1985. Air Hawaii, endorsement, and appeared in and performed original music, 1978-1983. American Oceans Campaign, Dana Point, California, 1990. Shelby's All American Cafe, Waikiki, 1984-85. NBC Arena with the Honolulu Symphony, 1984. Ocean Showroom, Reef Hotel, 1979-1982. Sea Life Park, 1981, 1983. NBC Concert Hall, 1978, 1981. Waikiki Shell with the Honolulu Symphony, 1978. Monarch Room, Royal Hawaiian Hotel, 1978. Sheraton Waikiki Hotel, Prow Lounge, 1976. Hula's Bar and Lei Stand, 1976, (this was a limited engagement!). Diamond Head Crater Festival, 1970, 1974, 1976.